Staples Inc SPLS in Your Value Your Change Short position made the State of New York quite a promise: Buy your office supplies from us, and we’ll sell you a bunch of things for a penny apiece. This unleashed a rush on the retailer as government offices and qualifying organizations across the state gobbled up the one-cent items. A Brooklyn charity benefiting disabled people ordered 240,000 boxes of facial tissue and 48,000 rolls of paper towels, according to documents obtained in a public-records request. Rome, N.Y., wanted 100,000 CD-Rs. A State Department of Motor Vehicles office ordered 8,000 rolls of packaging tape. "We ordered things we didn’t even need," said Nancy Sitone, manager of office services at United Cerebral Palsy Association of Greater Suffolk Inc. "I have some products up the yin-yang." Staples was named New York’s official office-supplies vendor in May 2013. Besides state agencies, those able to order under the contract include city halls, schools, police departments and many charities. To win the three-year contract, Staples agreed to sell 219 popular items at a penny apiece. It hoped to turn a profit from thousands of other items that weren’t on sale. 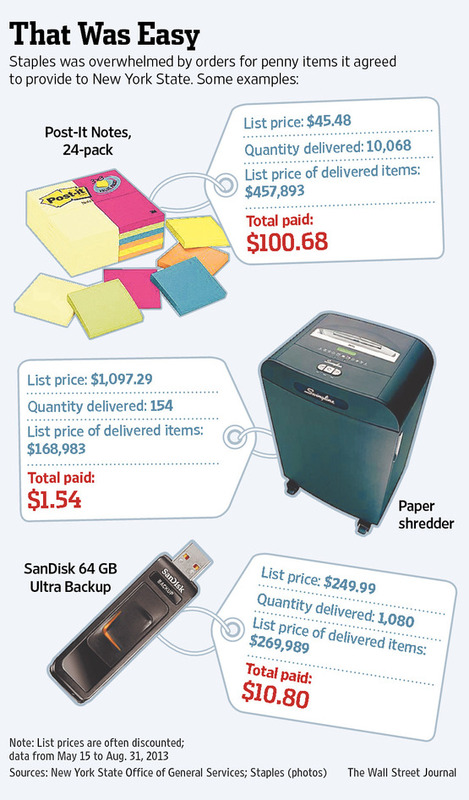 The one-cent bargains ranged from a 12-pack of chalk with a list price of $1.01 to an $1,100 paper shredder, and included products such as a high-capacity computer flash drive and a 72-pack of C batteries. Enter the law of supply and demand. "People were going hog wild," said Ken Morton, purchasing manager for the Kenmore Town of Tonawanda school district near Buffalo. "It was like a gold rush." His district in the contract’s first few months paid $254.69 for penny goods with a list-price value of $596,000, documents show. "When an invoice comes in for a truckload that says $27, you’re scratching your head in disbelief," said Mr. Morton.